I am not by training or comprehension a chemist. But there is something about the chemical processes I quite enjoy. The process from alchemical work that I love most, is of course calcinatio: the burning to white ash of a plant material (any material, really) soaked in alcohol. 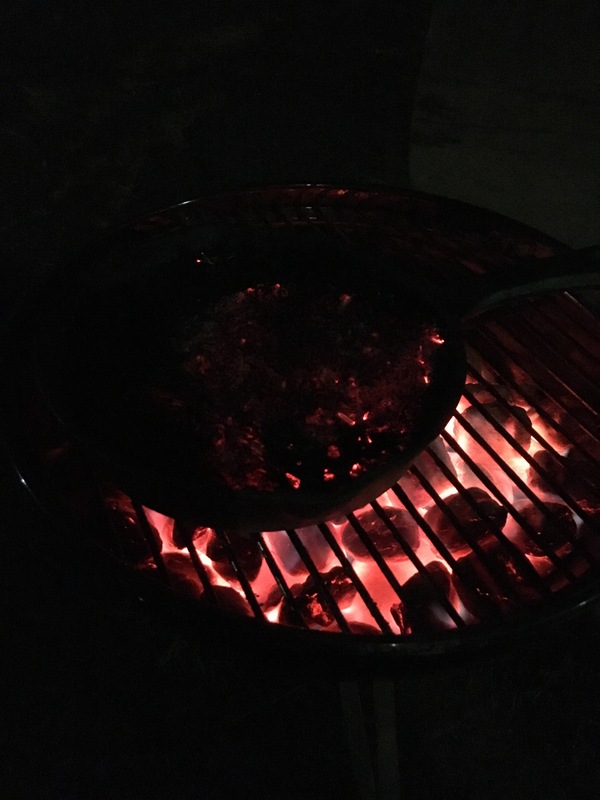 Part of it is that I have an excuse to start up a fire in my athanor – excuse me I mean my Weber grill. 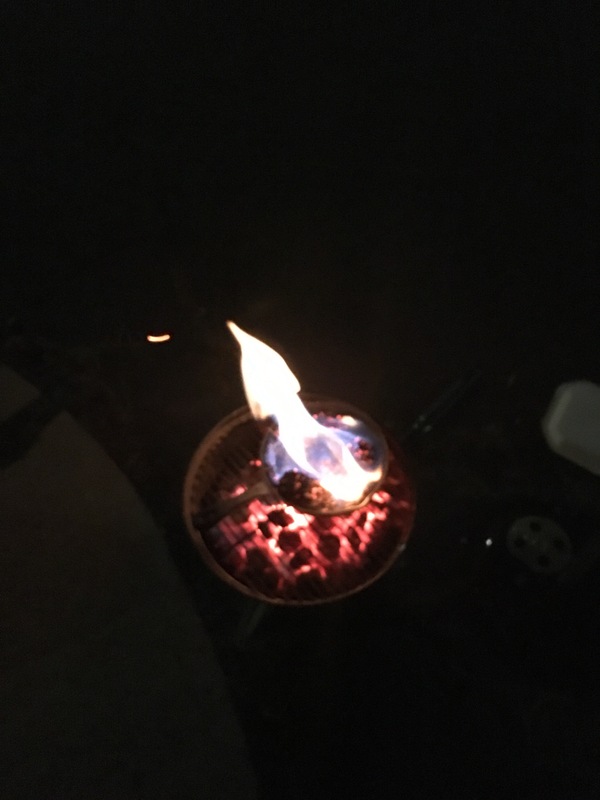 I put an iron pan of an herb soaked in grain alcohol on the grill, and wait while it gets hot enough to burn off the alcohol, and for the flames to turn blue. But it’s only now — the twelfth or fifteenth time that I’ve done it — that I have any clear sense of what’s happening. The carbon and other flame-sensitive volatiles in the plant matter are burning off and being converted to vapor and smoke. What is left is the residuum: the plant’s essentials that are not reducible by Fire to Air (smoke and vapor) or Water (liquid converted to gas). This is the Earth of the plant, the remnant. It’s interesting that even a century after the development of the periodic table of the elements, I can still see on a gross scale exactly what the medieval alchemists were getting at when they spoke about the four elements — and that it’s easier to understand what’s happening in an alchemical way than it is to understand in the terminology of modern chemistry. There’s an opportunity for learning here, really: can we teach chemistry directly? Or should we help students understand the alchemical origins of modern chemistry, through direct observation of Fire (heat), Water (liquids and solvents), Air (the behavior of gasses), and Earth (irreducible solid components)? Early in the process, of course, the visuals are stunning. Watching a fire burn at night, and gathering information about what’s happening, is deeply seductive. This particular Vervain (Verbena officinalis) burns blue, partly from the alcohol used as a solvent to begin the breakdown of the plant matter, and partly from the vaporization of the burnable matter in the plant — cellulose, carbon, and volatiles. What remains in the Earth of the plant — essential solid components that do not burn at these temperatures, and whiten (or at least gray-en) under the application of extreme heat until the ashes turn orange and sometimes even cherry-red in the flame. When the flame cools and the charcoal dies down, you’re left with white ashes. Eventually, this will be an alchemical salt — a spagyric tincture added to white ash of the same plant — which was one of the first efforts, historically, at making more potent medicines from herbs with known medicinal value. I can’t say that I will ever want to take this salt. But I do find it interesting and valuable to realize that an internal change has taken place in me from doing the work. Namely, this: we are not complicated creatures, us humans. We learn often learn things by doing, by copying, and by understanding a range of experiences with a range of words and language that matches what our senses tell us. When the language drifts too far from what we can see, touch, taste, feel, smell, and experience as a whole — we tend to lose ourselves in abstraction. But something burning on a fire is real and present in a way that engages all the senses, and teaches us things about the world that our ancestors knew intimately well.